So, croutons. I’m a crouton girl. Sometimes I eat a salad just so I can put croutons on it. The same goes for homemade ranch dressing. So sometimes I forego the vegetable part all together and just dip croutons in ranch. Cutting out the middle man, ya know? I also love fresh croutons on hot soup. The way that crunchy bread soaks up the hot liquid so it’s soft and buttery on the bottom and crisp and crunchy on top? 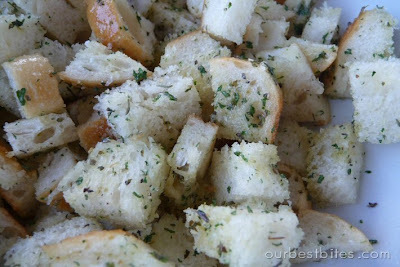 So beautiful it almost makes me tear up just thinking about it.Making your own croutons at home is so easy and they are so much better than anything from a box. It’s a great way to use up bread that’s still good, but just a tad bit too dry to eat on its own. So enjoy this how-to and put it to the test. You may never go back to store-bought again! 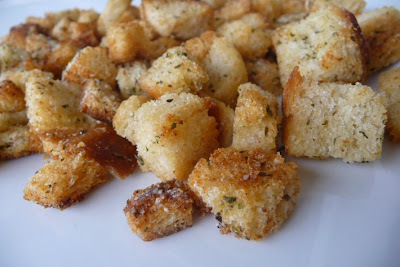 Although the recipe below is for sourdough croutons, you can certainly use any type of bread you like. Experiment with different flavors and textures and you’ll have fun finding your favorite. I think a hearty, rustic loaf works best, as opposed to say scraps of wonder bread. A day old baguette would be perfect. Fresh, or slightly dry bread works fine, but skip the super dry, stale stuff unless you’re in the mood to break a tooth. The fresher the bread the more light and airy the crouton. Play around with flavors depending on how you’re using them. Doing a southwest salad? Try using chili powder and cumin. A little smoked paprika tastes awesome when they top Smokey Bean Soup with Ham and Bacon. You can cook croutons on the stove top using a skillet, as well as in the oven. If you just need a few, say one piece of bread for a single or double serving, just bust out a fry pan and cook them on medium heat until golden brown. If you’re cooking a whole batch, like in my recipe below, go for the oven. I personally like the texture and finished product of baked croutons, so I do most of mine in the oven. 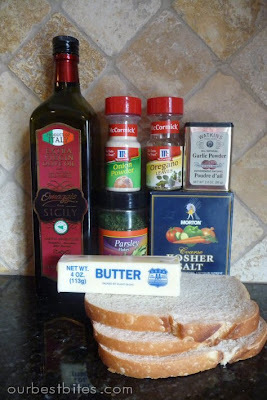 Also an option: scrap all of the seasonings above and just throw on this garlic bread seasoning! In a small bowl combine salt, onion, garlic, oregano, and parsley and set aside. Melt butter in the microwave until completely melted and then combine it with the olive oil. Place bread cubes in a large bowl and pour the butter/oil mixture over the bread cubes making sure to distribute evenly over the cubes in a small drizzle. Don’t dump it all in one place. If you do that, a few lucky little bread bits will soak up all the buttery goodness and the rest will get hurt feelings from being left out. Immediately use your hands to toss making sure to coat each bread cube with the butter mixture. Sprinkle the herb mixture over the bread cubes, again, making sure to distribute it evenly and use your hands to coat well. Spread cubes in a single layer on a baking sheet. Place in oven and cook for 10-20 minutes, stirring and flipping every 5 minutes so they cook evenly. The time is going to vary depending on the type of bread used and the size of the cubes. The croutons should be golden brown. Generally, they will take 15-20 minutes. When finished, remove from oven and immediately toss with Parmesan cheese if desired. Let cool completely.. Store in an airtight container. I used to work at a restaurant that made fresh ones and made their own ranch dressing. I frequently had a snack of croutons and ranch dressing! Oh, yum! I will definitely be trying this out. I am a crouton girl, too. Yum. Yum. 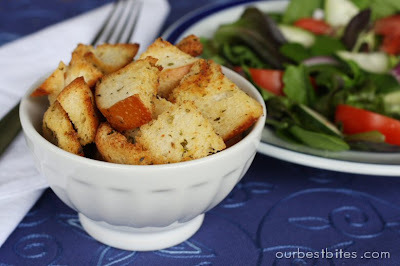 I love to eat croutons all by themselves, I’ll have to give this recipe a try! I have been dying for a homemade crouton recipe!! Talk about an early birthday present! My sister in law HATES salad but when we go to Texas Roadhouse, she’ll order croutons and a side of ranch instead. Yeah, so you’re totally not alone! In college I used to put them on top of my spaghetti since I never had garlic bread to go with it. I love croutons! By the way, I’m going to get back to you guys soon – I just have some questions that I need to word right. Evan is sick so my brain is gone. Expect an email soon! Hey I just wanted to say that I love your blog, I’ve been reading it for a couple of months now. I was wandering do you have a recipe for homemade ranch dressing, I have yet to find one that I like. Funny about the ranch dressing. I too have made a lot of different recipes, and have yet to find “The One.” Mostly because no matter how good they are, strangely I always like the taste of Hidden Valley Ranch mix (the seasoning mix you make at home- not the plastic bottle, ick!) better! And the really funny thing is that I can’t tell you how many times I have come across restaurants giving out their “secret homemade ranch” recipe and it begins with “one packet ranch dressing mix…” haha. I do however like to doctor it up sometimes. I’ll make the packet and then add fresh garlic, parsley, etc. So, yes, I have recipes, but no not one I LOVE. But it’s on my list of things I’m constantly experimenting with. Anyone out there have a good one? Let us know and maybe it will make an appearance here! Actually, Kate- don’t you have one?? I kinda remember seeing that on our schedule once. Have you been holding out on us?! 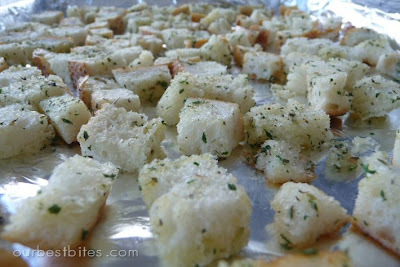 Love to make croutons the smells are great thanks for sharing recipe. Anyway, I only ever put croutons on salad or eat them plain. And I guess since I do eat them plain, I never have them around to try on other things, like soup. I love a good crouton and will sometimes eat salad just to eat croutons!! We have a local grocery store that makes amazing croutons in their deli. I go there just to buy croutons! Will definitely be giving these a try! Thanks! I love croutons in my tomato soup! Thanks for this great recipe…I think I’ll try it tonight! Those look delicious! I love croutons, but hate salad…perhaps I can cut out the middle man too. This condiment isn’t just for salads—it’s also a dip, a marinade, and a flavoring for snack foods (think Doritos). 1. Put mayonnaise, onion salt, chives, parsley, garlic powder, salt, pepper, and oregano into a medium mixing bowl and stir to combine. Beat mayonnaise mixture with an electric mixer on low speed for about 5 seconds, then increase speed to medium and beat until smooth, about 20 seconds. Scrape dressing down sides of bowl with a rubber spatula. Increase speed to high and gradually add buttermilk, beating constantly until all the buttermilk is incorporated and the dressing is very smooth, about 2 minutes more. 2. Cover and refrigerate dressing for at least 12 hours. Stir dressing well before serving. Dressing will keep, refrigerated in a cover container, for up to 2 weeks. Wow..that recipe for the ranch dressing looks amazing! I AM a crouton person, especially homemade. I sneak them plain before dinner and love them on soup. Wow, I have to say that this is something I’ve never done… but they look so good!! I made these the other day using the whole-wheat bread I make, and left out the parsley, ’cause I didn’t have any. I also like to lightly drizzle Balsamic vinegar over them before baking to add a little punch. Ranch Dressing–I grew up with and still love the Hidden Valley mix, but the Buttermilk version. I love croutons too, in fact, when I am eating a salad and I run out of croutons, that's it, I am done with my salad. Claim Jumper restaurant makes some delicious corn bread croutons, I'd love to try to make some of those as well. I have to say I adore the way you write, it's too cute and funny! Very cool recipe, something to remind myself to start doing! Do you happen to have a yummy sourdough bread recipe? Nevermind, just read some recipes online and it seems like WAAAAY more effort than it's probably worth! This is insanely good with rye bread. I had rye garlic croutons at a restaurant in Park City and fell madly in love. Even my picky husband liked them and he doesn't like rye! I bet these would be great with some rosemary on them too. I just have to tell you how much I love these croutons! I’ve been using this recipe for over a year. They are a hit at home and wherever I take them. Thank you! Made this crouton recipe for our chicken caesar salad tonight. 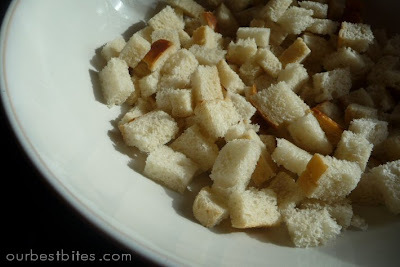 We had a half loaf of sourdough bread that had gone stale, which were a great base for the croutons. They were delicious and perfect!